If you've purchased a used router for your home Cisco lab there is a chance that no matter what changes you make to your starting-config (after running the router#copy run start command) when the router is reset it does not seem to save anything you do. This is most likely due to running of password recovery on the router. 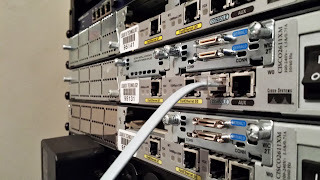 Resale companies, in preparation of wiping the routers clean, need reset the router to a factory state and need to run password recovery to get around the pre-existing security settings. While this is great, so that you don't have to, many times they forget to change the configuration register settings back to a mode that will allow the router to boot from your changed config. Just follow these steps and you should be back in action in no time. 1) First things first. Run a router#show version . Press space bar to get to the bottom of the readout. What we are looking for is "Configuration register is 0x2142". Each number has a specific purpose but the key number we are looking to change here is the 4. The 4 in this instance tells the router to 'Ignore the contents of Non-Volatile RAM'. And no NVRM equals no custom configuration. 2) Next we are going to change the 4 to a 0 to allow contents from NVRAM to be loaded when the router is turned on. Simply go to router#configure terminal. Once in configuration mode type (may vary on different routers) Router(config)#config-register 0x2102. 3)To test this we can now run a router#show version again and you should see now at the bottom that configuration 0x2102 will take on the routers next reload. Before doing this go ahead and change the hostname and maybe add a logging synchronous so it's obvious that our new starting config has been loaded. Now save the config by typing router#copy run start. 4) Finally restart the router by entering router#reload. And that's that. You should now be able to load your saved config file from the NVRAM allowing you to save your work when the router is reset.